Our carbide drill steel insert (DSI) is made with high quality tungsten carbide. We are manufacturer of different DSI sizes. Our Drill Steel Inserts (D S Inserts) are brazed on Integral Drill Steel Rods to drill the hole for blasting. 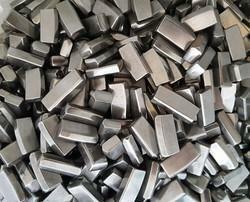 We are offering Tungsten Carbide Insert to our clients. In order to cater the variegated demands of our precious clients, we are offering a wide range of Plastic Injection Moulded Components. Looking For Dealers Accros Maharastra . We Have Best Quality Coated TPNK Inserts For Face Milling Operations for Stainless Steel Special Grade . We are the foremost firm of Carbide Inserts. These products are made as per industry norms and demand.